Chennai Regions rain Analysis by Karthik Added. Karthik Raghavan's Excellent Analysis of Tamil Nadu Weather Summary 2013. Superb Presentation ! Its in Detail and can be viewed on Stats and Analysis Page. What do the next few Days hold for the Sub-Continent? Plenty of variety and a mixture of Heavy rains and dry weather. Heavy Rain Watch for Cities: Hyderabad (India), Gangtok. Heavy rains in Northern AP State, with Hyderabad (India) and surrounding regions getting heavy showers Monday night thru Tuesday. Around 40-45 mms possible. (Trough in the Upper atmosphere). A vertical line Northwards may bring some evening showers to adjoining Vidarbh and focus will be on Amravati District. Nagpur can get a thunder shower on Monday evening...upto 15 mms. Heavy falls in Bhutan, Sikkim, Upper Assam regions and Northern parts of NE States.Heavy rains in the plains of southern Nepal and adjoining Uttarakhand. Kathmandu is surely in line for some heavy thunder showers Monday evening. Konkan and Goa will get the scattered showers, with just 20-30 mms in interior Konkan. Dry in Sindh and Northern regions of Pakistan. Showers tapering away Westwards. Heavy Rain Watch for Cities: Hyderabad (India), Dehra Dun. Heavy Rains in Northern AP. Regions to watch again, Hyderabad, with heavy showers. Central and Southern Nepal continue to get heavy rains for 2nd day. 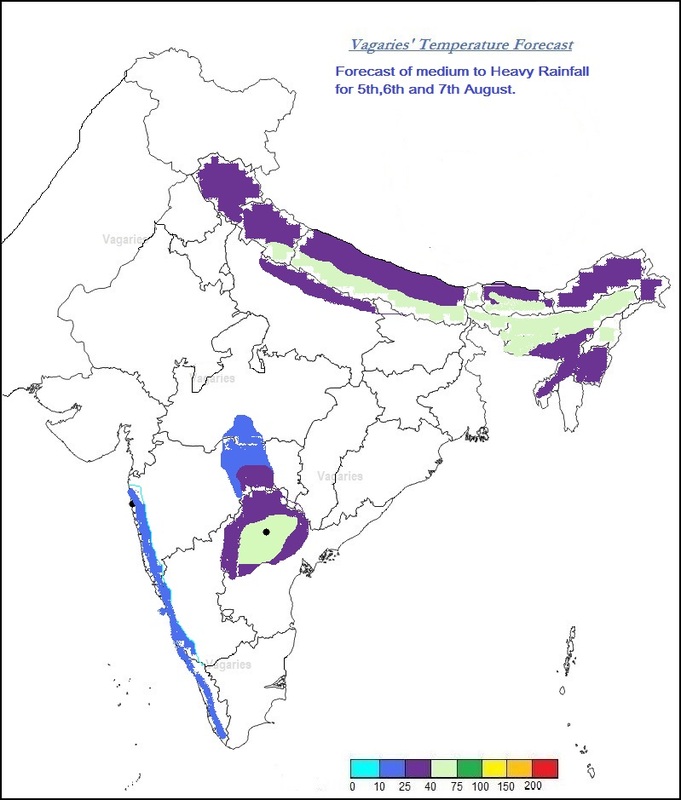 Reduced rains in Konkan and rest of India continues. Dry in most of Pakistan except Western most regions. Overall reduction in rains all over. Except a few heavy falls over HP and Utterakhand. Mumbai: Brief passing showers. 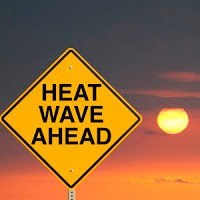 Sunny periods will tend to be hot, and days may rise to 32c. Daily rainfall may not exceed 7-10 mms. Delhi NCR: Positive chances of Thunder showers on Monday or Tuesday evening in some parts. Rainfall upto 10-15 mms possible per day. Bangalore: Cloudy, with chances of rain in some parts. Kolkata: Some showers possible in some areas, specially on Monday. Rest of the days few showers in parts. Saturday's overnight rain amounts for Karachi: Karachi (North) 136, Karachi (A/P) 103, Karachi Landhi 98, Thatta 95, Karachi (Masroor) 79, Karachi (Faisal) 79, Karachi (Faisal) 70, Karachi Sadar 47 mms, . Mr mohsin, do not wish us anymore rain for at least ten days. A break necessary for infrastructure to be restored. Rajesh, do you think Kerala can be clubbed in blue streak (ref ur map). I am see clouds off Kerala coast. Your prdictions coming true. Hyderabad getting intermittant showers. Rains increasing in Kathmandu for sure. Local met office also warning three days of heavy rains starting monday evening. Welcome break in the rains in Goa. Occasional shower but lot of sunshine! Blue skies and cirrus clouds after a long time! Welcome break in rains in Mumbai too. Breezy conditions but light clouds and occasional passing showers, sun shine in between. Nice. Low pressure below 1000mb forms over Orissa, central... Still curious to know why this does not happen over southern states - only means to bring rains to parched interiors. It shows not one region in the South is in deficit. In fact, SI Karnataka is, to-date, 39% in excess over the historical average! I think Avantash to be specific it is South east interior Karnataka - near to Rayalseema, interior KAR. You can see yourself to Rohits depiction where the figures stand compare with Maharashtra interior rains figures. seet, once again you are comparing two different regions - it is a pointless and futile exercise (average SM monsoon rain for the regions you mentioned is much lesser than average SM monsoon rains in Marathwada/Madhya Maharashtra). Check the link I gave - on your left select whichever year you want and see for yourself deviations from normal for say, rayalseema and marathwada/madhya maharashtra. there is nothing in it. I am afraid, and most of the people here would agree, it is nothing but a bias you have against SW monsoon rains in West-Central India.